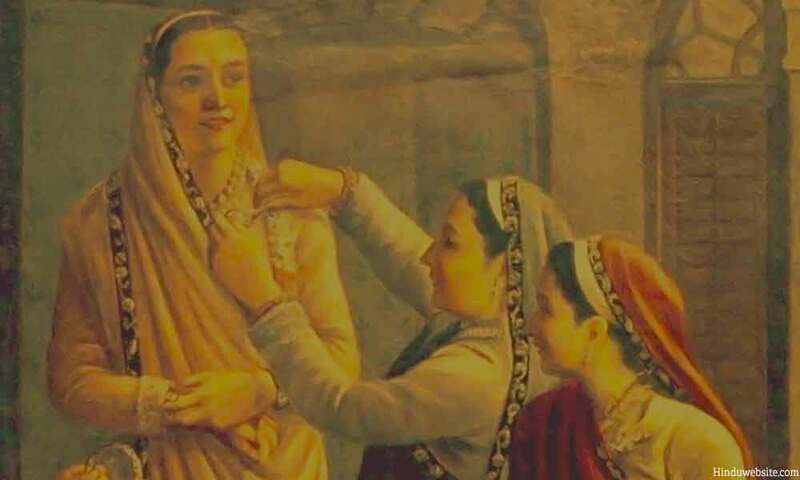 Decorating a Bride, From a Painting by Raja Ravi Varma. O maiden of many auspicious qualities, I tie this sacred thread around your neck for my long life. May you live happily for a hundred years! According to Hinduism, marriage (vivaha) between two persons is a sacred relationship that is not limited to this life alone. It extends across seven or more lives, during which the couple help each other progress spiritually. The adage that marriages are made in heaven is very much true in case of Hinduism. Two souls come together and marry because their karmas are intertwined and they have to resolve many things together upon earth in order to ensure their mutual salvation. The relationship between a couple is essentially a relationship of the souls. It is not necessary that their gender roles are fixed for ever. Some times they may switch roles and the husband may become the wife and the wife the husband. Sometimes they may also temporarily part their ways and come together again after one or two lives in a grand reunion. Marriage in Hinduism is a sacred relationship. It is both an obligatory duty (dharma) and a samskara (sacrament). Unless a person renounces life and accepts the life of a renouncer (sanyasi), he is expected to marry and lead a householder's life. It is an essential aspect of the four ashramas (brahmacharya, grihastha, vanaprastha and sanyasa)1 and the four aims (purusharthas) of human life, namely, dharma, artha (wealth), kama (sensuous pleasures) and moksha (salvation). For a Hindu woman marriage marks the end of her life as a maiden. She has to leave her parent's home to begin life anew in her her husband's house, amidst new people and new surroundings. After marriage her relationship with her parents remain formal and minimal. Marriage therefore become a matter of anxiety and stress for many women, till they become familiar with their new surroundings and the new people in their lives. The early stages of marriage is a make or break situation in case of many. It is also the period during which the bride either becomes popular in her new home or unpopular, depending upon her behavior and her relationships with each member of her husband's family. Hindu marriage tradition recognizes seven different types of marriage, ranging from the popularly known arranged marriages to the extremely rare and forced marriages through abduction. Generally most of the marriages are arranged with the consent of the bride and the bridegroom and the blessings of the elders. Caste, natal charts, gotra (kinship or family lineage), family background, financial status of the groom, appearance and character of the bride and the bridegroom, the willingness of the parents are some important considerations in arranged marriages. In some parts of southern India, marriages between cousins (children of brother and sister) are considered normal. In ancient India, if a woman's husband died, she had the permission to marry her deceased husband's brother, strictly for the purpose of progeny. Polygamy was an acceptable norm in ancient Hindu society. But presently Hindus are expected to be strictly monogamous. Love marriages are on the increase, but there is still a lot of skepticism about them. Love marriages within the same caste and financial background are favored, compared to inter-caste and inter-religious marriages. Couples who dare cross the social conventions have to cope with a lot of social pressure within their families and outside. These problems are more acute in the rural areas compared to the urban areas and metropolitan cities. Much depends upon the family background. If parents are educated and enlightened on both sides, things would be easier for the children, who get involved in unconventional relationships. One of the evils of Hindu marriages is the ubiquitous dowry system. The amount of dowry can be a very substantial amount, even in dollar terms, depending upon the financial status of the parties involved. Sometimes greedy mother-in-laws and husbands subject the poor brides to innumerable hardships for not meeting their expectations in respect of the dowry. Cases of bride burning are not unknown. Indian penal code prescribes severe punishment for such acts. But the cases take years and decades before the courts deliver justice. Hindu marriages are also very expensive because of the status, dowry, expensive gifts, family prestige and other issues involved. The bride's parents have to bear the brunt of most of the expenses and in many cases it leads to their financial indebtedness. In arranged marriages the marriage is consummated through elaborate ceremonies presided over by a Vedic priest well versed in Vedic mantras. The marriage date is fixed after consulting the astrological charts and then invitations are sent. Before the marriage date, both the parties spend a lot of time in preparation and exchange of gifts. On the marriage day, the bride and the bridegroom and relations on both sides assemble in a public auditorium or a temple premises, or in the house of the bride's parents and participate in an elaborate ceremony conducted by a priest. The marriage ceremony is generally a lengthy affair. A lot of vedic mantras are chanted during the ceremony, while a band plays on in the back ground. All the guests are entertained with food and beverages. Meat and alcohol are not generally served during such ceremonies, except in some communities. In the last part of the ceremony the bridegroom ties a sacred thread (mangalsutram) or a gold necklace around the bride's neck with three knots, accepts her hand in marriage (panigrahanam) and then takes seven steps (saptapadi) together with her, uttering vows of friendship, loyalty and righteousness. After this both of them play some traditional games between themselves to lighten the atmosphere and provide entertainment to the guests. This is followed by a gift ceremony during which the couple acknowledge the gifts brought by the guests for the their wedding. The marriage rituals usually vary from region to region and caste to caste. However following are some of the most common and popular rituals. Grooming - On the day of the marriage or a day before, the bride and bridegroom are given a ceremonial bath in their respective parent's home. Their nails are polished and they are decorated in the traditional fashion. In case of bride, her hands and feet are decorated with henna (mehendi) and turmeric. The groom wears the traditional dress of white cotton dhoti and the girl a well decorated saree. Welcoming the groom and his family (Vara Satkaaram, baraathi) - The groom usually arrives at the marriage place on a horse back or in a vehicle, in a procession, accompanied by all his family members and a musical band, his face covered with the flowers dangling from his headgear. When the procession reaches the gate or the entrance to the marriage place, the bride's family members and relations receive them with a lot of fan fare. After some dancing and hugging, they are led to a specially designated place, where they are seated and served with snacks and drinks till the marriage begins officially and the bride is invited to the marriage altar (mandap). Feasting - All the invitees to the marriage are served with meals and sweetmeats, usually by the bride's parents. In some instances the expenses are shared by the groom side also. The bride and the bridegroom are usually kept on fast till the marriage is officially completed. Receiving the groom at the marriage altar (madhuparkam)- Before the marriage begins, the bride's father receives the bridegroom at the marriage altar. He washes his feet with water and gives him new clothes to wear. The groom then goes into a room to wear the new clothes presented by the bride's father. Gifting the bride (kanya danam)- As the priest chants the mantras, the bride's father first gives away his daughter to the gods and then, with gods as the witnesses to the bridegroom. The bridegroom promises to look after the bride as his better half and protect her for the rest of her life. Fire ceremony (homam) - The sacred fire is lit and the priests chant sacred mantras offering oblations to various gods to make the marriage a success and bless the couple. Accepting the bride (pani grahanam) - The groom holds the left hand of the bride with his right hand, as a symbolic gesture of accepting her as his bride, amidst vedic chants and some accompanying rituals. Marriage vows (pratigya karan) - The bride and the groom take vows to remain loyal to each other, performing their respective dharmas (duties). Walking around fire (agni parikrama) - The bride and the bride groom walk around fire seven times, with fire as the witness, to sanctify the marriage. In some communities, the groom ties a sacred thread (mangal sutra) around the neck of the bride as a mark of the marriage bond. Taking seven steps together (seven steps) - The bride and the groom walk seven steps together, each step calling for a particular auspicious situation in their lives: nourishment, strength, prosperity, happiness, progeny, long life and harmony and understanding. Star gazing - The bride and the groom are shown either the pole star or the star of Arundhathi, advising them to remain steadfast in their lives like the stars. Breaking the fast (anna prasan) : The couple share a meal together and express their mutual love and affection. Receiving Blessings - Elderly members of both families bless the couple and give them various gifts as a mark of their affection and status. Playing fun games - The marriage rituals are usually followed by some fun games between the bride and the groom, such as picking a ring from a vessel filled with water, playing with flower balls etc. One of the important ceremonies associated with Hindu marriages is the handing over ceremony (bidai), which bears a lot of sentimental significance for the girl's family. During this ceremony the bride is handed over to the bridegroom and his parents by the brides parents, amidst a display of rare emotions, with a request to look after their daughter for the rest of her life. After this, the bride leaves her parents house permanently to spend the rest of her life in her husband's house. Hindus accept registered marriages also as a part of the social changes that are sweeping across their society. But many would prefer a traditional marriage for the sake of the sentimental thrill that is associated with them. A few simple and straight facts about Hindu marriages. 1. Hindu marriage is essentially an extension of the four aims (purusharthas) and the four stages (ashramas) of human life. Unless a person has accepted the life of renunciation out of his intense longing for liberation, marriage is sacred responsibility (dharma) of each and every individual in society. 3. Hindus consider marriage as a sacred relationship, between two souls, not just two bodies. Marriage is meant for the continuation of family and practice of dharma. In Hindu tradition, there is no concept as divorce. Once married, a couple are wedded for life. Divorce is a modern practice introduced into Hindu society through the Hindu Marriage Act in India. 5. Hindus believe that the marriage relationship extends beyond one's life. 6. In the traditional marriage, the bride and the bridegroom are considered as divinities. The bride is first married to gods and then placed under the bridegroom's protection as a gift from gods. 7. At the time of marriage, the bridegroom ties a sacred thread around the bride's neck and accepts her hand (panigrahanam.) in marriage. Then they both take seven steps (saptapadi) together around the fire uttering vows of friendship and mutual loyalty. 8. Hindu marriage tradition recognizes the importance of a woman in the family. She is expected to share the responsibilities of the household like a goddess (grihalakshmi) and enjoy the love and care of her husband and children. 9. According to Hindu marriage Act 1955 passed in India, the eligible age for marriage is 21 years in case of a boy and 18 years in case of a girl. This law has been passed mainly to ban child marriages and such practices as polygamy, which is recognized as a punishable offence. 1. Brahmacharya is the practice of celibacy as a student, grihastha is the life as a householder, vanaprastha is life of a forest dweller when one retires into a forest after retiring from active duty and sanyasa is life of renunciation).